San Diego Comic Con or SDCC is one of the biggest hobby/entertainment events of the year. Every year, various companies showcase their toy lines etc by releasing items exclusive to SDCC it can be as simple as an alternate cover for a comic book or a toy that is solely designed to be a special exclusive. Groove collaborated with DC Comics earlier this year to release two Pullips based on beloved DC Comics characters as SDCC exclusives, Wonder Woman and Harley Quinn! This is not the first time that Groove has collaborated with DC Comics, they have previously collaborated to bring us Pullips based on Catwoman and Batgirl in 2011. Two versions of Pullip Catwoman and Pullip Batgirl were released as a part of this collaboration, one set was exclusive to SDCC and the other set was exclusive to Wonder Festival (a major hobby event in Japan) shortly after. One year later, Groove again collaborated with DC Comics to release Pullip Wonder Woman and Taeyang Batman as SDCC exclusives. Just a few short months after their release the NYCC exclusive Pullip Harley Quinn joined the series, her release marked the one and only time that there has been a NYCC exclusive Pullip release (so far). 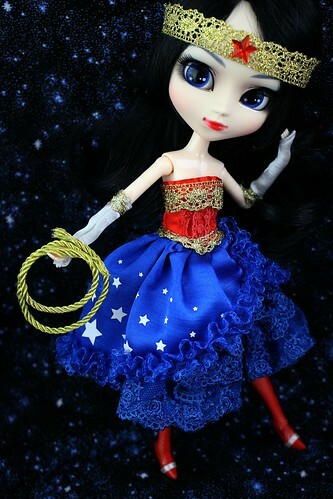 In 2013, superheroine Pullip Supergirl released as a SDCC exclusive and when Groove collaborated with Tokidoki in 2014 to release Tokidoki themed superheroes Pullip Super Stella & Dal Vendettina it seemed like the Pullip x DC Comics may have come to an end especially when there was no exclusives last year. JPGroove started hinting in early July via their Facebook page that they would be attending SDCC this year and that there would once again be SDCC exclusive dolls. 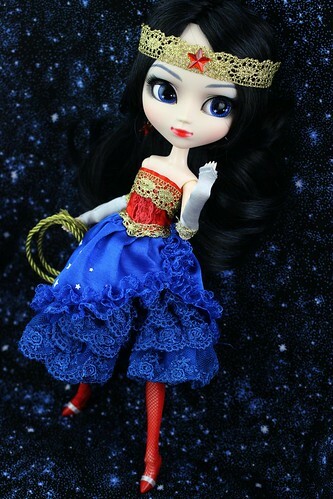 After a bit of teasing the dolls, Pullip Wonder Woman Dress Version and Pullip Harley Quinn Dress Version were finally revealed a few days before SDCC. The dolls The dolls were available for purchase at SDCC via the Teddy Scares booth as well as via JPGroove’s website, the dolls were priced at $130 each at SDCC or $155.99 each via their website (there was 15% off coupon available for use during SDCC). I purchased Pullip Wonder Woman Dress Version alongside Pullip Harley Quinn Dress Version via JPGroove recently, I’ve already posted a review of Pullip Harley Quinn Dress Version which you can see here so now it’s time for Pullip Wonder Woman Dress Version to have her moment in the spotlight! Wise as Athena, Swifter than Hermes….And Stronger than hercules…..I am an Amazon Warrior….Feel Like So. 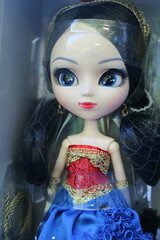 Pullip Wonder Woman Dress Version in the box. 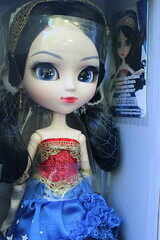 Like most of the SDCC dolls before her, Pullip Wonder Woman Dress Version comes in one of the slimmer boxes without a display window. 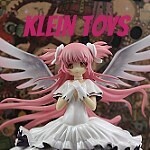 Even though she comes in one of the smaller boxes she still comes with a black plastic stand and a card. I honestly don’t mind the slimmer boxes, to me the dolls are meant to be displayed not to be imprisoned in their boxes forever. Another reason why I don’t really mind the slimmer boxes especially with a doll like Wonder Woman is traditionally the SDCC dolls have been kind of barebones in terms of accessories, she comes with her “lasso of truth” but if she was in a full sized box that box would be looking like it was missing something because it is mostly empty. It should be noted that she does not come with a numbered certificate and that it is currently not known how limited either of this year’s SDCC dolls are. 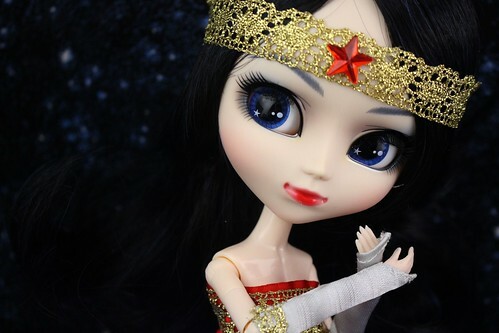 Let’s take a closer look at Wonder Woman Dress Version’s face up! To me, her most notable feature is her lips which are an intense, vibrant red. I knew they were red from the promotional photos but I did not realize just how bright and vibrant they were! The lips are kind of overdrawn to make them appear fuller, it’s still the same face sculpt but I like that Groove makes the effort to try to alter the shape up a little bit by paint it makes her a bit different and unique. Her eye makeup is smoky and dramatic, she has heavy, dramatic eyelashes on the top with a little bit of lighter eye makeup underneath in alternating shades of black and blue. Her eyebrows are very fierce. 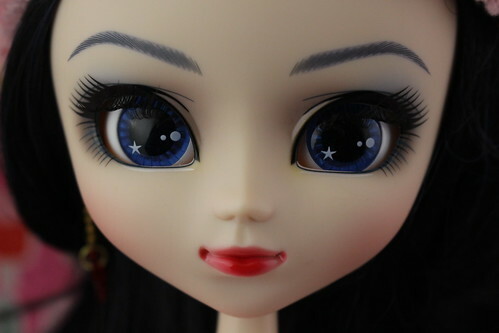 The eyechips themselves are a brilliant shade of blue, the foiling gives them a little depth and I absolutely love the little star detailing in her eyes. She does come with pierced ears and dangly star earrings with a gold chain and a clear plastic red star, they are a cute little addition. The wig is decent quality, it’s got long feathered bangs that I kind of pushed off to the side with the headband so I could see her pretty face better. The wig is very soft. The color of the wig is a mix of black and very dark blue similar to the original Pullip Wonder Woman’s wig, I actually like that it is mixed as I think it would have been too dark it needs that little bit of contrast in there. 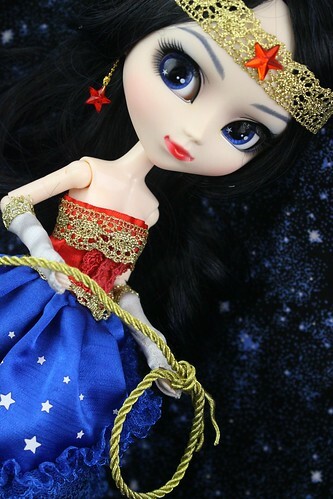 Let’s take a closer look at Pullip Wonder Woman Dress Version’s stock now! Compared to Pullip Harley Quinn Dress Version’s stock there aren’t a lot of pieces there but Wonder Woman’s costumes always seem to be a little bit on the simpler side. 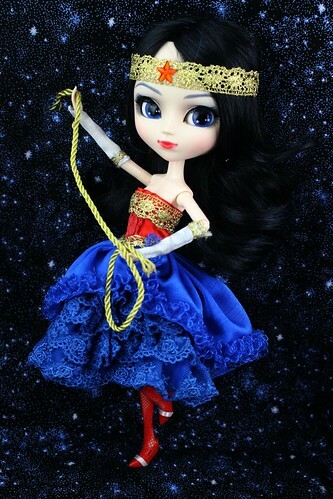 Pullip Wonder Woman’s stock consists of a one-piece dress, high heels, tights, a headband, gloves and rope (lasso of truth). The dress has a red velvet-like bodice with gold lace detailing. The design of the skirt is asymmetrical, it’s design is similar to Pullip Cornice’s in appearance but unlike Cornice’s skirt which is actually made up of two layers (layered lace skirt and overskirt) it is a single piece and actually part of the dress. The color of the skirt is absolutely fantastic shade of blue and I love the inclusion of the white stars and how it ties in with her traditional costume. Her headband is made up of gold lace with a red star to accent it. She also comes with red fishnet tights and heels, I like that the heels are accented with a white stripe similar to her boots in her traditional outfit. She does come with a “lasso of truth” which is a gold length of rope, the more it’s handled the more likely it is to become unraveled I went at the ends of mine with a glue gun to make sure it mostly stayed together. It’s kind of a neat accessory to include and it was definitely a fun prop to photograph her with. I know when people think about Wonder Woman’s outfit the iconic one that springs to mind for most person is a body suit but did you know that back in 1941 when Wonder Woman made her debut in comics her outfit originally included a skirt? 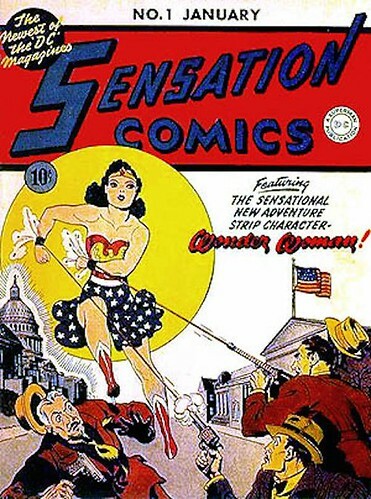 Above is the first cover illustration of a comic that featured Wonder Woman from January 1942, you can definitely see her star spangled skirt in all it’s glory there! Wonder Woman’s skirt was quickly phased out in favor of the more practical choice of shorts but I like that Groove seems to be giving a bit of a nod to Wonder Woman’s origins with their take on Wonder Woman. By no means is Groove’s interpretation a faithful recreation of the exact outfit she wore but it’s an elevated interpretation of it, all of the pieces are we recognize as being true to being a part of Wonder Woman’s design are there her headband is quite similar to her tiara and her gloves are reminiscent of her gauntlets, etc. Comics are constantly evolving with the times, it’s a good thing I know people are sometimes resistant to change especially with beloved characters but it’s necessary to so they stay relevant otherwise Wonder Woman would still be stuck being the secretary for the Justice Society of America (the precursor to the Justice League) ugh . There are timeless qualities and characterizations that make the character who they are and those shouldn’t be messed with but sometimes things just need to be updated to keep with the times, Captain America can only fight Nazis for so long after World War II has ended after all. Wonder Woman has become a feminist icon, she continues to show girls that you can be a strong warrior as well as being beautiful. I know that this interpretation is more of a traditionally feminine one but I think her fierce personality and strength still shines through. I think my only complaint about Wonder Woman Dress Version is that I wish that the lacy section of the skirt was just a little bit more full as it likes to kind of deflate and fold in on itself if you aren’t paying attention while posing her. The Lasso of Truth really is a fun accessory/prop to play with in photos, I love how Wonder Woman herself lends herself to such dynamic poses for photos I really had a fun time photographing her. I love the contrast of her pale skin against the vibrancy of all the other colors used her in her face up and her stock outfit. Her pale skin makes the other colors stand out as that much brighter. I think the gloves are a nicer, more elegant form of Wonder Woman’s Bracelets of Submission versus the normal version which is much more gauntlet-like. In the comics etc she is able to use the bracelets to deflect attacks I’m not quite sure the gloves are quite up for the task but they do look fantastic! 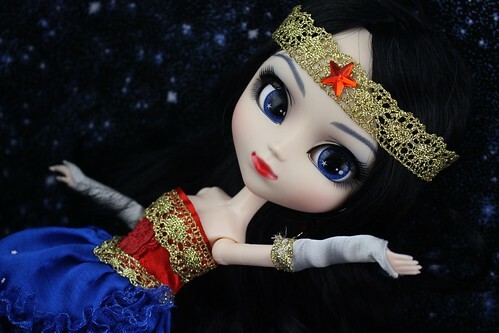 Pullip Wonder Woman Dress Version is such a beautiful and fierce doll! I hope you have enjoyed this unique intrepation of Wonder Woman as much as I have. 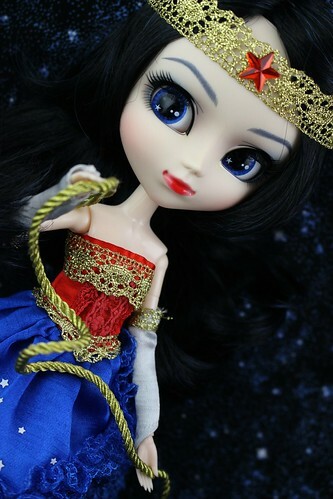 More photos of Pullip Wonder Woman Dress Version can be seen on my flickr. 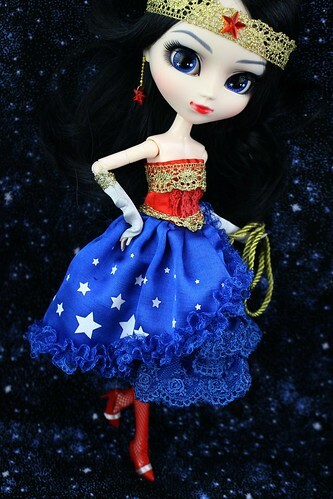 If you like Pullip Wonder Woman Dress Version she is available for purchase via JPGroove as well as Pullipstyle. I hope you enjoyed this review, I believe Beary Fairy Isul Gosomi will be the next to be reviewed here. 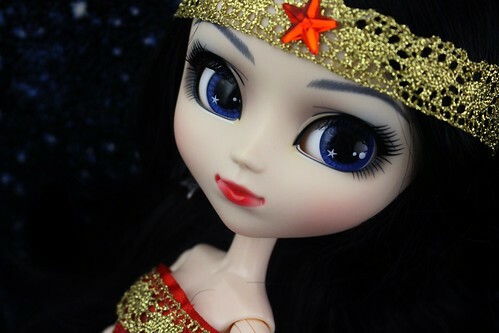 This entry was posted in 2016 Groove, Doll, Pullip and tagged asian fashion doll, dc comics, Doll, fashion doll, Pullip, pullip x DC comics, sdcc, wonder woman, wonder woman dress version. Bookmark the permalink.